A trampoline weight limit is, more often than not, laid out completely for you in the general description of the trampoline. Even though it’s usually a number that’s completely straightforward, it’s important to know what exactly goes into said limit. 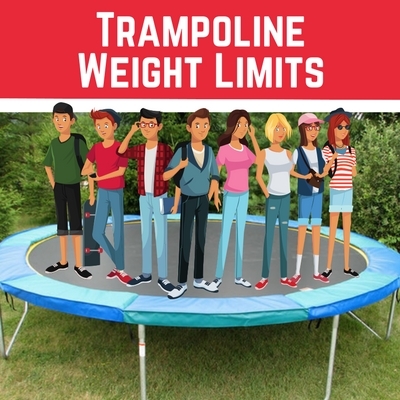 Weight limits on trampolines give you a clear picture as to which trampoline is right for you and your family. The limited amount of basic math, adding everyone’s weight to see if it can hold, is optional if not everyone is going to be using it at the same time. With all of this in mind, we’ve created a guide that gives you insight into trampoline weight limit, a high weight trampoline list, and some snippets of other important information that will no doubt be useful to you. 1 Why Trampoline Weight Limit? 3 How Are Trampoline Weight Limits Determined? 6.1 What is a high weight trampoline? 6.2 How much weight can a trampoline hold? 6.3 Where can I get a trampoline with high weight limit? Ask anyone about a trampoline, and they will usually mention the weight limit. Other times, however, it can be overlooked. This is because most people do not realize how important it is. Paying attention to the weight limit of your trampoline could very well increase your awareness of how safely you’re using it. If you purchase a trampoline that has a weight rating for a small child, such as a toddler trampoline, but you put an adult who weighs 150 pounds on it, you will put unnecessary stress on the springs, the mat, and the frame. This simple fact should be a given, but some people do not pay attention to the warning signs of a potential problem. On the other side of things, if you have a trampoline that has a weight limit of 400 pounds (like some adult trampolines), and you put 3 adults on it, you run the same risks. However, 3 kids would be able to jump without worrying over the weight limit of the trampoline jumping surface. All of this means that, before you run out and purchase a trampoline for your family, you need to consider how much weight may be put onto it. Not just today, but even a few years from now. The reason for this is simple – kids do grow up. They have friends over and, therefore, a higher weight limit may still be preferable. How Are Trampoline Weight Limits Determined? To understand this, you must first kind of understand what trampolines are made of. The weight limit for trampolines is determined by the materials it’s made of. For instance, a trampoline with a lower weight capacity will use springs that are easier to flex, whereas a trampoline with a higher weight capacity will have tighter springs. There may also be different types of metal in the frame and added support for the trampolines with a higher weight limit. The same can be said for the difference between a professional trampoline over a trampoline that is designed for home and casual use. One type of trampoline will be more efficient in tolerating the higher weight capacity because it’s more for group use compared to another type. A trick trampoline may have a lower weight limit so that the bouncer can get more spring in his bounce, especially since there is a good chance that the trick bouncer will be on the trampoline alone. Either way, the mat is probably still going to be made with waterproof canvas or woven polypropylene materials. However, the steel coiled springs and supports on it are where you will see the difference. Weight limits on trampolines are one thing, but finding a high weight trampoline that’s somewhat personalized to what you’re looking for exactly is where the real battle starts. Check out our top 3 high weight trampolines and see which one is right for you! 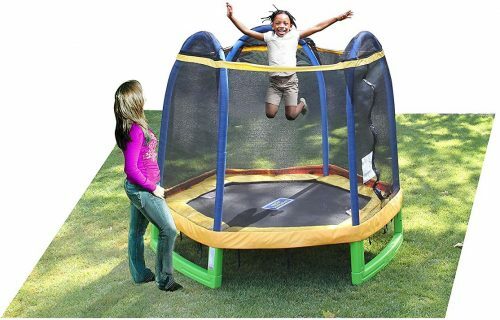 The My First Trampoline by Sportspower is the ultimate trampoline for kids with a higher weight limit. At this time of writing, there is no clear price defined, but this should change within the near future, so keep your eye out for a good deal on one! It’s a heavy-duty trampoline that is crafted with a foam outer edge with a durable, versatile design that is both low to the ground and meant to be kept outdoors. It also has “No Scratch” safety springs, which every parent will surely love. The soft foam padded edges ensure that your child won’t hurt themselves if they happen to fall or bump up against them. This 84” trampoline with high weight limit uses a lightweight, yet very sturdy, galvanized steel frame and uses a net enclosure to keep your child safe and inside the trampoline at all times. The best part about this high weight trampoline is the weight limit. This trampoline has a maximum weight limit of up to 220 pounds, making it easy to fit a couple of kids, an adult and a child, etc at one time! 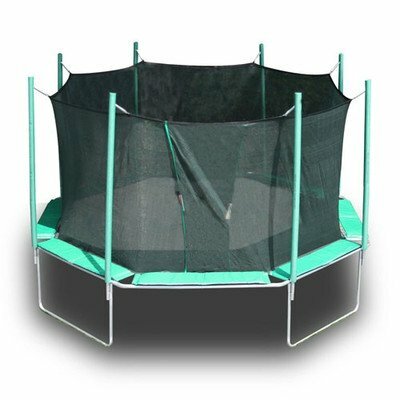 Another great pro when it comes to this high weight trampoline, is that it’s able to be brought inside for some indoor fun! It’s not a terribly big trampoline, holding the size dimensions of only 84”x74” when fully built, so it doesn’t take up massive amounts of space. Unfortunately, it can be difficult to put together if you’re doing it on your own. All of the spring slots on the trampoline’s frame must be lined up exactly facing forward, even those that are on the joints, which can cause some confusion and overall difficulty. The Magic Circle Octagon Trampoline by KIDWISE will currently set you back around $970, but it’s well worth the price you’re paying. It’s built with a 14 gauge galvanized steel frame that’s backed by a 10-year warranty, as well as 112 8.5” tapered springs that provide the ultimate bounce, normally only used in gymnastics trampolines. It’s a 16-foot trampoline that features one of the biggest jumping mats out on the market today, as well as 1.9” top rails, also made from 14 gauge steel, and 4 1-piece legs. What’s more, each side has their own safety pad that is attached to the first and the last spring, giving it all around protection that can’t be beat. Right off the bat, we’d like to mention that this high weight capacity trampoline has a whopping weight limit of up to 450 pounds! This is actually one of the strongest trampolines on the market available right now. What’s more, there are no tools required to put this trampoline together, which will no doubt be a breath of relief for those who aren’t so handy. Unfortunately, it does not come with any kind of net enclosure system. You can, however, get the Magic Cage, which is the enclosure netting that goes with this trampoline, if you choose to purchase it separately. 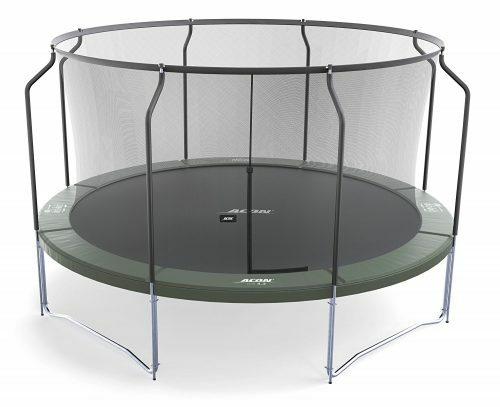 The 4.6 15’ Trampoline by ACON Air is currently sitting at the price of $820. This one, thankfully, comes with an enclosure that you don’t have to get separately! This 15-foot trampoline has a 6 times cross sewed, polypropylene, UV-treat mat. It uses 110 8.5 heavy gauge springs, galvanized frame pipes both inside and outside of the trampoline, and is designed to survive being outside during the cold, bitter winter months. It uses a foam spring pad that is much thicker than anything else you’ll find, as well as 15.5 pounds of pre-load force applied to the springs, giving you the best bounce possible. If you’ve ever tried to look for a trampoline that has an infinite weight limit, then you’ve finally found it! This high weight trampoline does not have any sort of maximum weight capacity whatsoever. Unfortunately, some buyers have claimed that the enclosure either doesn’t show up, or was not offered at all. You will also need to purchase the ladder on your own, if you choose to do so. Either way, all complaints should be taken up with the manufacturer, in this sort of case, as soon as possible. Before you run out to purchase your new trampoline, always make sure you have reviewed and seriously consider the trampoline weight limit that goes with it. You will then want to look at user reviews and the trampoline specs to determine if said trampoline is right for you. By doing these things, you will be able to eliminate all of your concerns about the trampoline weight limit on the one you are looking at. If you don’t see your question, or an answer to it, listed below in our FAQ section on trampoline weight limits, get in touch with us and we’ll do our best to help you out! What is a high weight trampoline? A high weight trampoline is one that offers a large maximum weight capacity. You will, however, need to take into consideration the type of trampoline you’re looking at. For example, we have the My First Trampoline above in our review section, which has a maximum weight limit of 220 pounds. Because this is also a children’s trampoline, you can see how this is a high weight trampoline in the case of it being for children. The amount of weight a trampoline can hold solely depends on the trampoline in question. For example, one trampoline may have a weight limit of up to 300 pounds, while another trampoline only has a limit of up to 200 pounds. In short, the amount of weight a trampoline can hold depends on the individual trampoline itself. Where can I get a trampoline with high weight limit? You can get your hands on a trampoline with high weight limit simply by scrolling up to our review section. We have chosen 3 high weight trampolines that will suit everyone’s individual needs and wants.